65. Levina Little. Daughter of Matthew Little & Isabella Hay (link to Hay family pages). Born 1861 in Harvey Sta. Died 11 May 1878 in Harvey Sta. Buried in Harvey Settlement Cemetery. From Daily Telegraph, 14 Dec 1877: "Married 12th inst., by Rev. Dr. Brooke, Thomas Wilson and Levina Little, both of Manners Sutton." Witnesses to marriage were Alex Little and Albert Little. Levina died at age 16 years 9 months, at birth of infant son, who also died. Harvey Settlement Cemetery Section A, Plot #44. 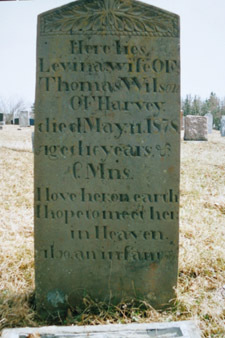 Here lies Levina, wife of Thomas Wilson of Harvey, Died May 11, 1878, Aged 16 years & 9 Mns. I love her on earth I hope to meet her in Heaven. Also an infant son. 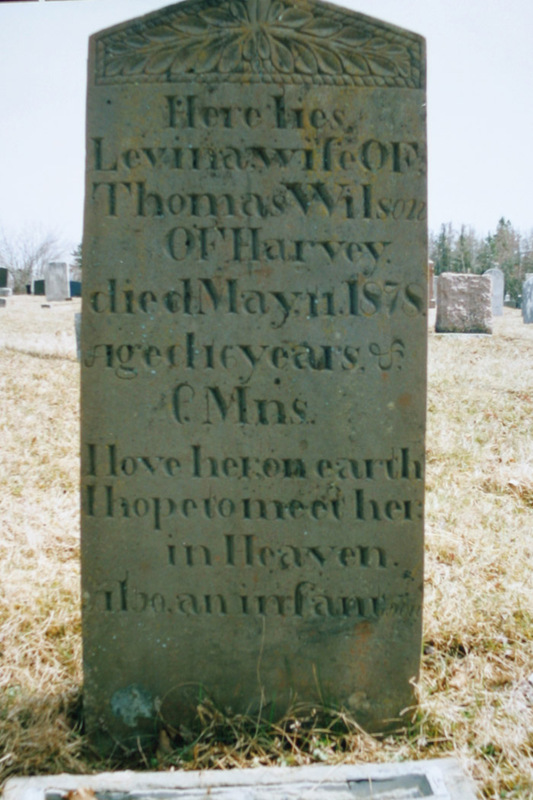 She married Thomas Wilson (link to Wilson family pages), son of Thomas Wilson (link to Wilson family pages) & Janet Little, 12 Dec 1877 in St. Pauls Church, Fredericton By Rev. John M. Brooke . Born 8 Dec 1853 in Harvey, NB. Died 28 Jan 1927 in Harvey Sta., NB. Buried in Harvey Settlement Cemetery. Occupation Farmer. Religion Presbyterian. Tom was an only son, he was a farmer and the family lived on the farm first settled by his father. Tom's first wife was Levina Little, daughter of Matthew Little and Isabella Hay. Levina died giving birth to a son who also died. His second marriage was to Eleanor Grieve, in 1881. Harvey Station, Feb 1 -- The death occurred at his home here on Friday morning of Thomas Wilson, one of Harvey's most respected residents, at the age of 73 years. Mr Wilson had been a lifelong resident of this locality, having been engaged in farming for many years. Although in failing health for several years he remained active and interested in the life of the community until death came suddenly at the last. He is survived by his wife, who was Eleanor T. Grieve; three sons, Hugh A., of Harvey; Willard N. of McAdam, and Thomas E. of New York; and seven daughters, Mrs J. A. Wood of Tweedside, Mrs Amos Moffitt of McAdam, Mrs Gordon Dykeman of Hoquiam, Wash., the Misses Mabel and Helen, of Portland, Me., and the Misses Zella and Dora, at home. The funeral took place from his late residence on Sunday afternoon and was very largely attended. Rev. G. E. Knight, pastor of the Presbyterian Church in Harvey, conducted a very impressive funeral service and sang a lovely solo, "Will the Circle Be Unbroken." Other hymns sung were "Asleep In Jesus" and "Peace, Perfect Peace." Interment was made in the Manners Sutton Cemetery.